I recently read that our “representatives” in Congress plan to authorize a yet-to-be named corporation to build 80 to 100 new LRS-B aircraft for the Air Force at a fixed price of no more than $550 million each. I immediately wanted to write something profound about how screwed up our priorities are in the good old US of A. But I decided to ignore the urge. What good would one more rant do from an old lady who specialized in the Cold War in grad school? Let’s set aside the argument about how much safer our country would be if we invested half that money in prenatal care, parenting classes, early childhood education and public schools that can afford to do the best job possible for each student based on that student’s abilities. Let’s set aside the debate about universal health care, a living wage and justice for all. Instead, I’ll tell you about a novel I read in a graduate level political science class back in the late 1980’s. It’s a story about a young Russian soldier who was sent to an outpost to guard military equipment and ammunition. When he arrived at the small village, there was no equipment, no ammunition dump, nothing of military value. He returned to his commanding officer and reported his non-findings. The officer assured him the equipment must be there because it was entered into the official military accounting ledger. So the young man went back two more times, each time looking in different sections of the countryside but finding nothing to report. After being told for the third time that the equipment had to be there, the young man moved to the village, married a local girl, raised a family and lived happily ever after, all the time collecting his military pay for finding nothing of value. The novelist’s intention was to point out the absurdity of life under Soviet rule. There were other stories about Russians being paid to dig holes and other Russians paid to fill them up again. Or how parts from one bus were scavenged to fix another bus, etc. I don’t know how many of those stories were true. Coincidentally, my daughter and her husband recently visited Macedonia as part of a church mission group. Macedonia has been independent from communist governance only since 1991. My son-in-law is a neurologist, my daughter a family therapist. My son-in-law visited some of the smaller hospitals outside the capital, Skopje. At two of them he found that the MRI machines were broken. He asked why they didn’t get repaired and was told the funding was never approved. When he returned to the main hospital and asked someone in authority why the machines weren’t fixed, he was told that the workers at those hospitals were just lazy and wouldn’t use them anyway. Is this a holdover from communist rule? I don’t know. That way of thinking sounds strange to us, but people who live everyday with certain values and attitudes don’t think it’s strange at all. Speaking of which, here’s another story from the Cold War era, one I can attest is absolutely true. While I was teaching at Southwest MO State U in the mid 80’s, a group of anti-war protesters decided to make the trip to Whiteman AFB for a public hearing. The event was held in a school auditorium near the base. We each filled out a card and gave it to someone who drew names from a box. Our contingent from SMS included at least one priest and two other faculty members in addition to about a dozen students. We all agreed to say the same thing if our name was drawn. Mine wasn’t drawn, but the priest’s was. He made an eloquent statement against the proposed plan………..(take a deep breath) to put nuclear missiles on railroad cars, store them on base, and then take them on tours around Missouri if there was an imminent threat of a Russian attack. No, this is not a Woody Allen movie. A very impressive high ranking Air Force officer gave the presentation on stage complete with a slide show on a huge screen behind him. With a straight face, he explained how clever it was to keep the missiles moving around the state so the Russians wouldn’t know where they were. The local residents applauded as if they’d been told someone was going to pay their mortgages and send their kids through college at no expense. One local woman said she was so thankful that the Air Force was right next door because it made her feel really safe. I don’t think I’d feel safe living within 10 miles of a target during a nuclear war, but maybe she did. Eventually, the plan was scrapped for reasons unknown to mere mortals like myself. But the military-industrial-congressional complex always needs more money, so the beat goes on. Whiteman AFB is home of some of “our” B-2 stealth bombers. Keep in mind these are the airplanes the Air Force now wants to replace with the new fleet of LRS-B “long-range strike bombers.” We keep hearing every day how warfare has changed. We cannot bomb our way to peace around the world. In fact, if we want to kill certain people, we have drones that are more accurate and safer for the video commandoes who “fly” them thousands of miles from the target. 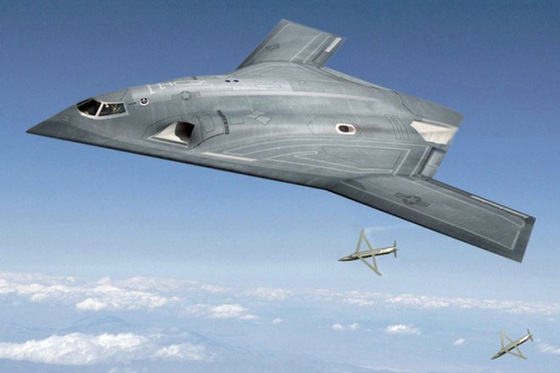 So why do we need 80 to 100 of these new long range bombers at a cost of “no more than” $550 million apiece? I don’t even know how many zeroes that figures out to be. But I know that’s a LOT of money that could be put to better use. Ironically, one of the reasons the Soviets had for assigning meaningless tasks to their citizens was because communism promised a basic standard of living for everyone. Everyone had a job to do no matter how useless. In the article about the new AF contract being let, the AF acquisitions chief, William LaPlante, was asked about the negative effect on jobs and the economy for the company that does not get the contract. He assured reporters that the AF “always considers broad industrial base issues in making contract awards.” In other words, jobs, jobs, jobs. I think it was David Stockman, one of President Reagan’s budget gurus who said in later years that the Cold War arms race was a contest to see which country could bankrupt the other first. He concluded that the U.S. won by a hair. Really? What have we won? Billions being spent on useless weapon systems, billions more being spent on maintaining the largest military complex in the world, and for what? We are about to enter the season of remembering and honoring those who serve and have served in the military. We thank them for their service. We pretend they are making us safer and protecting our freedom. We have to maintain the pretense because we need the jobs and because we hate to admit we are shortchanging our children and grandchildren in order to pay for our fantasy of superiority. We can’t bomb our way to peace and prosperity. But we willingly cough up the money for 80 to 100 airplanes at the cost of “no more than” $550 million each. If this is “winning,” I’d hate to see what losing would have done to us.